Ask A Tech: Is My Freezer Going Bad? Your commercial freezer is a critical part of your kitchen operations. If your freezer were to fail tomorrow, how much inventory would you lose as a result? More importantly, how many customers would you be forced to turn away because of spoiled food? If ice starts to accumulate over your freezer coil, this could be indicative of many things. Your freezer’s defrosting mechanism might not be working properly, or may be burned out. Ice on the coil could also be an indicator that your defrost thermostat is out of order. If you’re starting to see ice forming, it’s an sign that your commercial freezer is in need of service. Turning up your commercial freezer could mean that your freezer is in need of service for a number of reasons. It could mean that your freezer compressor could be going bad, forcing the freezer to work harder in order to produce cold air. Another situation could be a faulty power line to your freezer. Don’t get stuck turning up the freezer– call in a technician to investigate the problem. Over time, the rubber gaskets wear out on your freezer door from repeated use. A bad gasket can let the cold seep out, resulting in more wear and tear on all your parts. If you’re noticing higher energy bills, or seeing discoloration on the freezer, consider getting a professional diagnosis today. If you’re concerned about the condition of your freezer or need commercial freezer parts now, call the certified technicians of CPS today about what you can do to fix the problem, before it becomes a bigger issue. Myths About Service Repair, Don’t Believe Them! 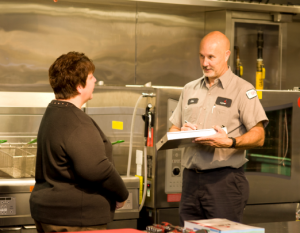 Why does CFESA Certification Matter?